This book covers the fundamental aspects of categorical data analysis with an emphasis on how to implement the models used in the book using SAS and SPSS. This is accomplished through the frequent use of examples, with relevant codes and instructions, that are closely related to the problems in the text. Concepts are explained in detail so that students can reproduce similar results on their own. Beginning with chapter two, exercises at the end of each chapter further strengthen students' understanding of the concepts by requiring them to apply some of the ideas expressed in the text in a more advanced capacity. Most of these exercises require intensive use of PC-based statistical software. Numerous tables with results of analyses, including interpretations of the results, further strengthen students' understanding of the material. 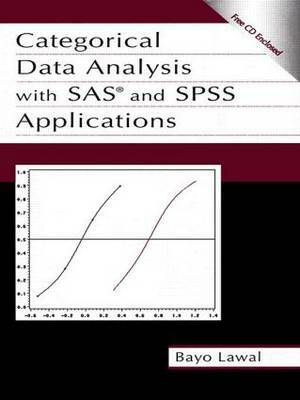 Categorical Data Analysis With SAS® and SPSS Applications features: *detailed programs and outputs of all examples illustrated in the book using SAS® 8.02 and SPSS on the book's CD; *detailed coverage of topics often ignored in other books, such as one-way classification (ch. 3), the analysis of doubly classified data (ch. 11), and generalized estimating equations (ch. 12); and *coverage of SAS® PROC FREQ, GENMOD, LOGISTIC, PROBIT, and CATMOD, as well as SPSS PROC CROSSTABS, GENLOG, LOGLINEAR, PROBIT, LOGISTIC, NUMREG, and PLUM. This book is ideal for upper-level undergraduate or graduate-level courses on categorical data analysis taught in departments of biostatistics, statistics, epidemiology, psychology, sociology, political science, and education. A prerequisite of one year of calculus and statistics is recommended. The book has been class tested by graduate students in the department of biometry and epidemiology at the Medical University of South Carolina.